Bringing joy to people through food. A cuisine which puts people first. Developing a signature flavor. Counter-side interactions with customers forge new opportunities. Sealing off what he had learned and getting a fresh start. After Kamiya, Ishikawa moved to a business hotel in Shiki, Saitama Prefecture. A new restaurant had been opened in the hotel, and he was appointed as head chef. The hotel was behind a train station in an under-trafficked area, and the shop had about twenty seats. So this was your first experience as a head chef. How was it? They had originally used a compact and tidy little space to serve breakfast, but the hotel had the idea to start serving three meals a day there. I originally thought that this would be a good place to solidify my skills without struggle. I was starting to feel haughty, since I had been told that learning the broth technique at Kamiya was invaluable to a career in cuisine. Once I actually started the job, though, the management gave me the directive that I was to handle everything, from running the shop to deciding each and every menu item. It was a drastic departure from what I was used to. We had so few customers that it was downright irritating. People wouldn’t even come for a 600 yen lunch. We distributed flyers in front of the train station, and there were few people who even wanted to take the things. We even experimented with bundling candy with the flyers. I assiduously read books on management. This continued, but I finally talked to the owner and we were able to get the base cost down and begin pitching the shop as a place to eat reasonably-priced fare. People started showing up. The store developed a rather solid reputation. Amazing. How long were you with the hotel? About two years. My master teacher went on to cook at a very major establishment, so I was immediately called on to back him up. 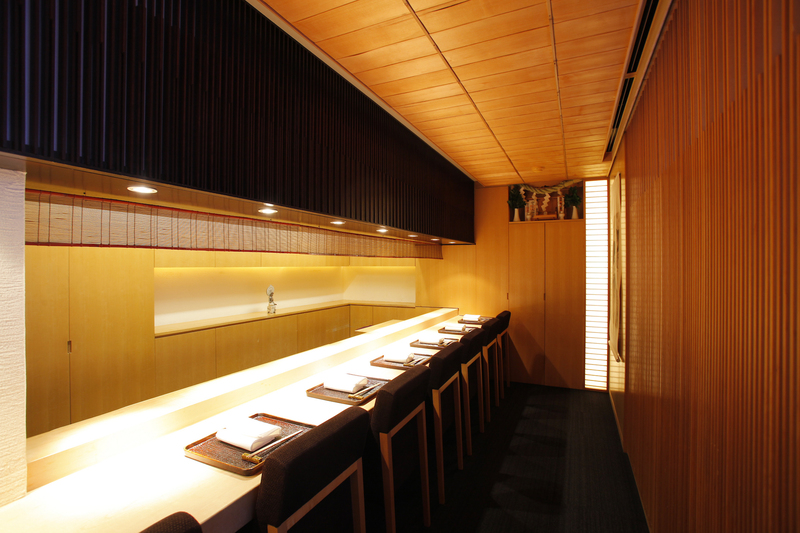 Then, when I was thirty-five, I became head chef of Okazaki, a traditional restaurant in Yaesu with about forty seats. Things started off slow here, but I realized that if I couldn’t build success with that shop, I would never have success anywhere, much less on my own. I saw to everything before me and set to getting it in ship-shape. That obviously meant things like cooking, but also going to the shop on days off to clean and refurbish the countertops with a wood plane. The owner came to trust me, and I started to gain other responsibilities. It was my first time working directly at a counter with patrons, so the experience was extremely educating. You get live feedback from customers when you work at the counter, after all. Precisely. They teach you a lot of things. You can see their reactions, consider how to revise the menu, et cetera. My sense of responsibility as head chef towards deciding all aspects of the food was quite large. This was also true of when I worked at the hotel in Saitama. Around that time, I was constantly exploring what my signature style was to be. Up until then, I faithfully copied what my masters had taught me. Even the way I blended ingredients was the same. As I started exploring what I considered to be a signature taste, I began to harbor my own doubts about others’ ways of blending. I decided to seal off what I had learned and put it into the vaults of history. I wanted to rebuild my own taste profile from the ground up, carefully selecting different brands of soy sauce, salt, and the like, unaided by the influence of my masters. 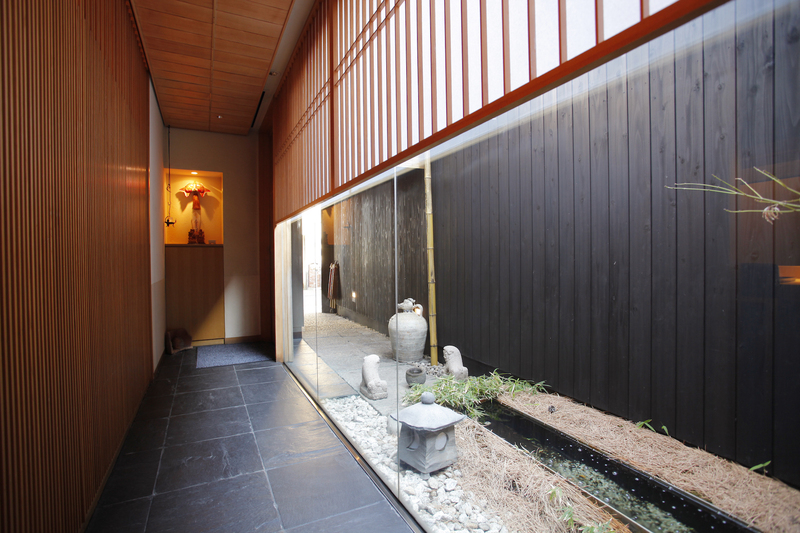 This was the era in which you developed what would become the profile for the Ishikawa restaurant. How did customers react? As I blended ingredients and tried composing the food in ways not done elsewhere, I would get a reaction, whether for good or bad. I would use this feedback to consider what my next experiment would be. Over time, this started to develop into a formula that brought back happy customers. When we first started, we were making about 2M yen a month, but by the end, it reached close to 6M. 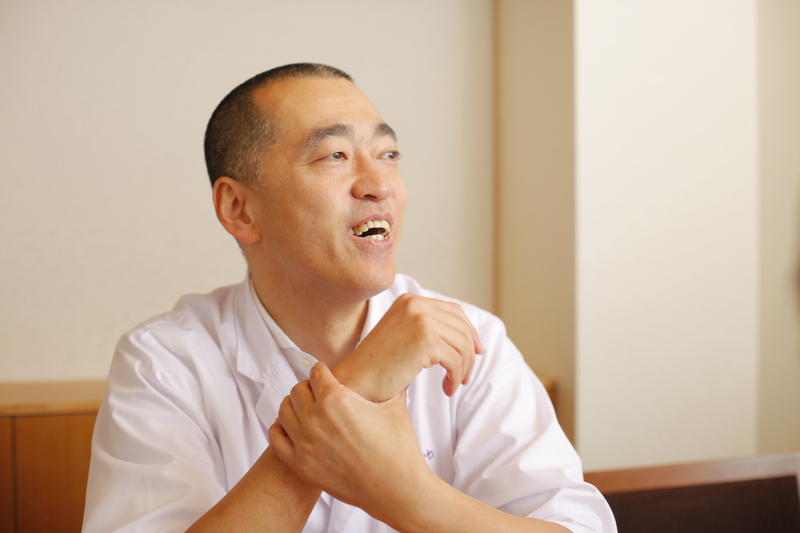 Ishikawa opened his eponymous restaurant at age thirty-eight with the help of Koji Koizumi (now head chef at Kohaku), who had worked with him since his days at Okazaki. Ishikawa had been planning his own shop since the Okazaki era, and he and Koizumi would often fantasize about what the shop would be like. What inspired you to go independent? After becoming head chef, I started thinking about what it meant to develop my own food, my own taste, almost so much that I went blue in the face. But I started hitting on the knack of something that customers liked, and this got the gears turning to make me think about going independent. It was around this time that there was talk of Okazaki changing hands to a new owner, so I took this as the opportunity to go off on my own. Was there a reason you chose Kagurazaka? I like pottery, and there was a gallery I liked going to on days off. I met an older gentleman there and we hit it off. He was a retired architectural designer. He told me he would design the shop for me, going so far as to even select the property.My only requirements were that the space be about 50 square meters in size and be in a location with a good reputation. He found the property where Kohaku now stands. That was originally where Ishikawa started. “Kagurazaka” also has a signature name. Was there any trepidation about opening the shop? And yet. Few patrons came. I kept the shop open from the evening through well into the midnight hours, yet there were only dribs and drabs of customers. So we had one, maybe two customers. But there was one point about a month after opening where literally nobody came for three days in a row. Three days in a row! That must have been psychologically trying. I was in quite a state. (laughs) Now I can laugh about it, but at the time I was physically shaking — I couldn’t even do the work, I was so shaken up. My parents had mortgaged their home in order to help me get financing from the bank, and I had borrowed money from my relatives. I had debt of 20M JPY — and here we were, with no customers for three days. I started feeling quite sorry for myself — “Now you’ve gone and done it, getting conceited and opening a shop of your own. You’re going to end up ruining everyone! I should just end it all! I’m unfit for this world.” At the same time, I decided to make every effort I could to shore things up. The next day, we decided the shop would open for the lunchtime hour. At the time, the kitchen staff consisted of you and Mr. Koizumi. Considering the time it takes to prepare food in advance, maintaining the same quality afternoon and evening is no mean feat. Exactly. I didn’t want inferior food that would spoil the shop’s image. We decided to serve a simple set of soba noodles and tempura for lunch. I felt that if we restricted the menu to this item, but carefully prepared the dipping sauce, real broth, and hand-rolled noodles, we could satisfy customers with quality food. To my surprise, customers started coming immediately. We started getting 20,000-30,000 yen in a day, and the register started filling up. I felt like my life had been saved! We still had to put our heads together to figure out how to get customers in the evenings, but I put all my energies on giving the best for our afternoon customers. We started getting some loyal patrons, one of whom was a writer that featured us in a national newspaper. We started to get a bit busier, which finally allowed us to close down the lunch hour and focus exclusively on the main event: dinner. How long did it take for the shop to get on track? About a year, I think. That seems like a short time now, but at the time, the days seemed to inch by. It was physically demanding, too. If Koizumi and the team had not been there to help, I don’t think I could have pulled through. We were supported so much by patrons and suppliers, so much so that I cannot even begin to thank them enough. It was around this time that I developed my management philosophy of creating a shop that would give back not just to customers, but to suppliers and to our staff. The restaurant is right behind the temple.